The Federal Court of Australia has travelled to the Kimberley region of Western Australia today to officially recognise the Jaru native title holders as the Traditional Owners of 23,591 square kilometres of country. Applicants Daisy Howard and Jane Long with family members. 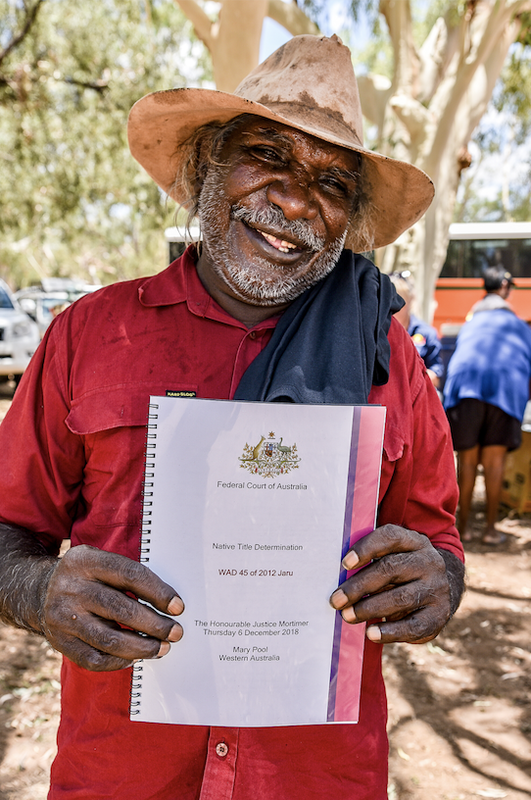 The native title determination was held at a place called Mary Pool, approximately 100 kilometres outside of Halls Creek and was attended by around 150 Traditional Owners. Jaru man and applicant Eddie Smith receives Native Title Determination from Justice Mortimer. Delivered by Justice Mortimer, the native title determination recognises both exclusive and non-exclusive native title rights and interests based on the Jaru native title holders continuing connection to country and in line with their traditional laws and customs, which have continued unbroken since before the British declared sovereignty across Western Australia in 1829. The Jaru native title holders have been recognised with exclusive possession native title in reserves held in trust by the Aboriginal Lands Trust, Lamboo pastoral lease, a number of Aboriginal-held leases over communities, and part of Carranya pastoral lease which is inside the determination area. Jaru man and applicant Lesley Whippy. Jaru man and Applicant Kimberley Baird said the determination presents an opportunity for Jaru people to move forward. Kimberley Land Council Deputy CEO Sarah Parriman congratulated the Jaru people on their long waited recognition of native title. “This is a very important moment in time for the Jaru Traditional Owners,” Ms Parriman said. “After years of dispossession, a determination of native title proves at law that the Jaru native title holders have an unbroken and ongoing connection to country. The Jaru native title determination is the fourth determination to occur in the Kimberley this year and means the Kimberley region is now 87.3 per cent native tittle determined.